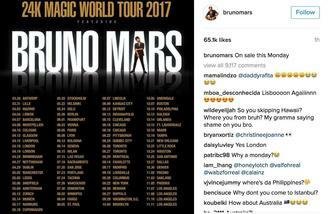 Bruno Mars has announced a 2017 world tour. The 31-year-old singer will release his brand new album '24k Magic' on Friday (18.11.16), and the star already has a whopping 85-date world tour lined up to go alongside the record. The tour kicks off in Antwerp, Belgium, on March 28, and will see the 'Grenade' hitmaker travel around Europe before heading to North America to start a lengthy leg of tour dates from July 15 in Las Vegas, all the way through to a four-night stint at The Forum in Los Angeles on November 8, 9, 10, and 11. Bruno's run of gigs also includes 10 shows around the UK in April and May, where he will visit Glasgow, Liverpool, London, Birmingham, Nottingham, Dublin, Manchester, Leeds, and Sheffield. Posting a photo of the list of tour dates on his Instagram, the 'Just The Way You Are' singer simply wrote: "On sale this Monday." Although fans only have four days left until the star's new album drops, those who pre-order it will have early access to the tour tickets before they go on general sale on Monday (21.11.16). Grammy Award-winning singer Tony Bennett regrets not talking to Amy Winehouse about her addiction before her untimely death. Morrissey was forced to cancel his concert in Denver on Monday night (14.11.16) after his keyboardist collapsed. Adele will tour Australia for the first time next year (17). Clean Bandit's new album is inspired by founding members Grace Chatto and Jack Patterson's break-up. Taylor Swift let Andy Cohen know Katy Perry was "the exact opposite of her friend" at the 2016 Met Gala. The final five Artist of the Year nominees for the 2016 American Music Awards have been unveiled. Una Healy's daughter was the first to hear the songs on her debut solo album. Green Day hate fans who use their phones during shows. Billy Bob Thornton wrote his first ever song aged three years old.